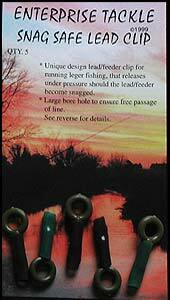 The snag safe lead clip is an attachment for leads or feeders used in running ledger set ups. It features a large, well-finished, plastic ring, similar to a Roberts running ring, allowing itself to run freely, giving minimal resistance, whilst on the mainline. The other end of the ring incorporates the actual clip itself, which can open up under pressure, releasing the attached lead/feeder should it become snagged. The clip itself is covered by a short length of soft tubing (supplied), which helps minimise tangles. A direct pull of approx.4lbs will release the clip from the lead, so sensibly strong Mainline is recommended.. The Protect A Bead is a specially shaped rubber bead incorporating a sleeve to take half a swivel. The Bead head is ideal for use with the Snag Safe lead clip and provides a tangle free stop. Your swivel is easily pushed into the sleeve end, giving knot protection, and a nice neat stand off against your chosen lead/feeder. I have used both products in my free running rigs, and have found them both to be very effective. The Safe clip works very well. 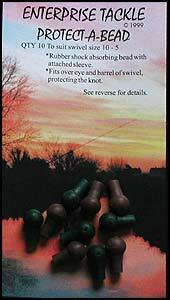 Having been snagged up in weirs many times, I have always been able to recover my baited hook, despite loosing many feeders. Changing from feeder to lead, or changing lead size, takes seconds, without having to take the whole rig apart. Something, which I like very much. Above all, they are both simple, cheap and effective. Available from all Enterprise tackle stockists.